Today we went to the King's College Maughan Library. The library is housed in the former public records office, which was built in the 1850s. In an effort to better support King's College students, the library is currently working on their roving librarian efforts, which will help get librarians out from behind their desks and into the library to help patrons. 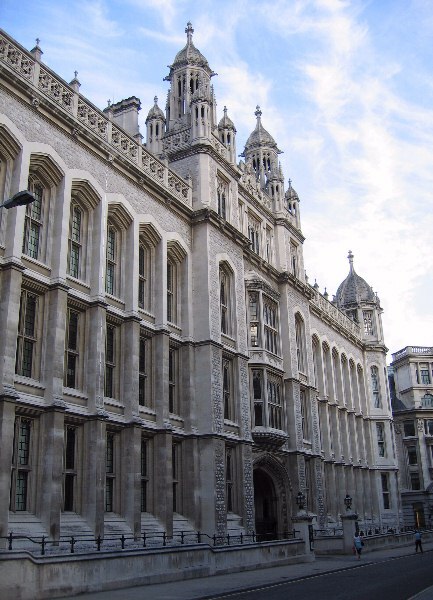 While at the Maughan library, we got to see their special collections which spans from the 15th century to present and holds roughly 150,000 items. One thing I was surprised to learn is that the special collections department still maintains a working card catalog. Thus, every new item acquired has a card made for it. Because most libraries are doing away with card catalogs in favor of online or electronic options, it was interesting to see a library that chose to maintain this format. The special collections for the Maughan include a strong medical collection, particularly of material pre-1900. During our visit, we saw a book donated by Florence Nightingale, a treatise on surgery from 1514, a manuscript on medicine from 1607. The latter actually incorporated elements of astrology, as it was still widely believed to be an important component of medicine at the time. Another incredibly rare item they have is a book produced in a concentration camp during WWII. This book is one of two known copies and depicts the concentration camps in a positive light; the books were created in anticipation of a visit from the Red Cross. Some of the drawings in the book show the prisoners of the camps in cafes or gardening.